The YES! program takes place over nine or ten sessions during the months of June and July. Up to 12 youth ages 14 to 19 are selected from applications submitted by mid-May. Transportation from Tucson and Vail is provided to the Las Cienegas National Conservation Area which is managed by the U.S. Bureau of Land Management – Tucson Field Office. The first sessions include an orientation to the area and an overview of management issues. Mid-program, students engage in activities such as assessing site conditions, training in facilitation, and project planning. During the final session participants carry out a project and evaluate their efforts. View the YES! Youth Engaged Stewardship Six-Year Summary. The YES! 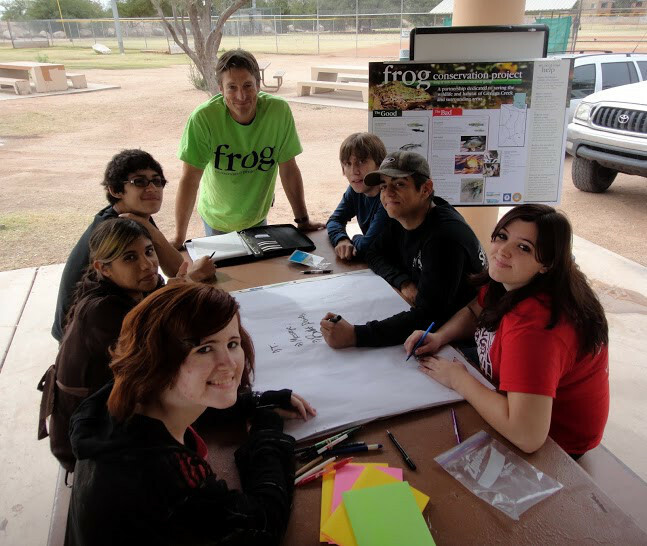 work has been supported by many others ranging from donors (Freeport-McMoran, Summit Hut, and B&B Cactus) to in-kind assistance provided by volunteer scientists from the YES! Partners, The Nature Conservancy, University of Arizona, the FROG Project, Arizona Game and Fish Department, and BLM resource managers. Scientists and managers from the BLM and other non-profit organizations are essential to the program providing ecological orientation, landscape assessment, and specific restoration skills. Ready to learn more? Check out the YES! program’s enduring impacts and view the schedule.